A member of the fierce Waorani tribe of Ecuador, young Dayuma was brutally orphaned by tribal violence. Taking the drastic choice to flee to the outside world, Dayuma eventually encountered Christ, and forever altered the destiny of her people. About "Dayuma (International Adventures Series)"
"On every continent, in every nation, God is at work in and through the lives of believers. From the streets of Amsterdam to remote Pacific islands to the jungles of Ecuador and beyond, each international adventure that emerges is a dramatic episode that could be directed only by the hand of God. The story of the five missionary martyrs in Ecuador comes full circle in the breathtaking true story of Dayuma, who left her tribe on a desperate odyssey into the unknown. Jim Elliot, Nate Saint, Pete Fleming, Roger Youderian, And Ed McCully chose to lay down their lives on a sandy beach in Ecuador. 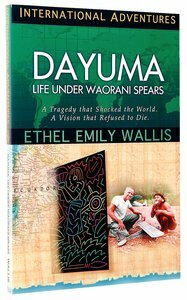 Their lives and sacrifice come full circle in the breathtaking true story of Dayuma.^Violent, unexpected death was a way of life for the mysterious Waorani tribe living deep in the Ecuadorian jungle. When her father is brutally speared, young Dayuma is faced with a clear yet frightening choice: flea to the outside world to those thought to be cannibals or stay in the jungle to face certain death from the spears of the tribal killers.^Dayuma: Life Under Waorani Spears is the unforgettable story of one girl's odyssey into the unknown. Her eventual encounter with Christ ultimately changed her life and forever altered the destiny of her people. Dayuma is a vivid, lasting testimony to the power of the love of God and the cross to reach beyond any barrier. Young Dutch couple Jeanette and Johan Lukasse followed God's call to Belo Horizonte, Brazil, and there came face to face with the immense suffering of Brazil's street children. Braving the constant threat of violence, the Lukasses transformed countless young lives in God's strength. After decades of service in Asian mission fields, Art Sandborn broke his neck in a freak accident. Because his spinal cord was partly severed, Art was told by doctors he would never walk again. But he did walk again - a testimony to the power of faith in all circumstances!